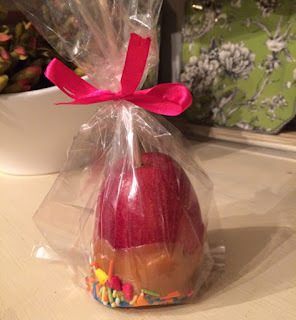 urbanbaby&toddler magazine: Easy Goodie Bag Alternative: Caramel Apples! Easy Goodie Bag Alternative: Caramel Apples! Ah, the dreaded goodie bags - A plastic baggie full of candy and junk plastic that ends up inducing a sugar high moment of mania, and mere seconds playtime with a kazoo or balloon before being tossed into the landfill. Let’s not mention the amount of money that we spend on these things!!! It’s pure insanity. There had to be a better way, right? I was inspired by a girlfriend to do exactly this – find a better way. And that better way was the ingenious idea of making CARAMEL APPLES for the party favours. What a win-win-win situation!! It’s a project that I can engage my kids into, it consists of a somewhat healthy alternative, and it’s inexpensive – only amounting to about $30 for 20 caramel apples! 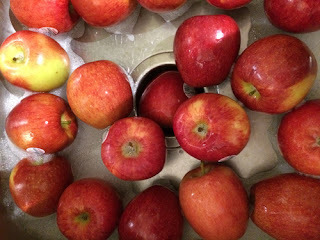 Wash and dry your apples thoroughly, remove stems, and insert dowels or popsicle sticks into the bottom of each apple. In a deep microwaveable container (I used a 2 cup glass measuring cup), unwrap and microwave 2 bags of caramels with 2 tablespoons of water. I zapped them for one minute at a time, and then stirred, then microwaved for another 45 seconds. Stir until all caramels are melted – you don’t want the caramel to be scorching hot; rather you want the remaining chunks of caramel to melt as you stir (if it’s too hot the caramel will slide off the apples). Dip each apple into the caramel mixture and let it drip off; then roll in the topping of your choice. Leave the caramel covered apple to dry on the parchment paper. Once dry (I left mine out overnight), place in plastic treat bag and tie with a ribbon! Viola! A great goodie bag alternative! Thanks to #AmberOrchardEvents for the amazing idea to make these Caramel Apples!